My Second Schema – For the Love of Code! Last time I really worked with results from the 2016 Presidential Election was recorded for posterity in a post from December 2016. Politico never did bother to finish entering complete election results so I’ve been waiting for the FEC to get around to releasing them officially. They finally have. Not in a format you can download or even in an Excel spreadsheet, mind you — of course not — but at least Acrobat Pro let me save the PDF as an Excel file that wasn’t too painful to clean up. Now to export that in a way that won’t be too painful to import into MySQL. UPDATE Many Minutes Later: Wow. Who would have thunk designing a “simple” database for this would take this much thought? 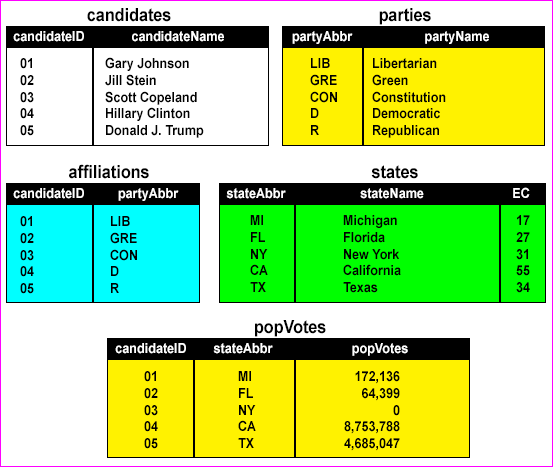 Originally, there were id columns for the parties and states tables. I may put those back but I like the human-readability of using party abbreviations and state abbreviations.